As an emergent yet rapidly maturing industry, the dominant trend for the cannabis industry is its patent growth. The marijuana industry has grown by billions each year in America, and today, more North American consumers have access to legal cannabis for both medical and recreational uses—and sales reflect this across the country as well as here in Nevada. By most industry metrics, the legal cannabiz is the fastest growing industry in the United States. Propelled by legalization in 29 states, Washington DC, and even Canada, the meteoric rise of the cannabis industry has resulted in consistent, year after year growth only matched by the dawning of broadband access. Do you know what marijuana market trends to take advantage of and which ones to learn from? Although it may appear that no aspect of the cannabiz will be left behind in the wake of state and then federal legalization, the landscape of the cannabis industry in Nevada and America at large is nuanced and can verge on the treacherous. As the industry is still federally illegal, there is very little historical and market data at the disposal of entrepreneurs and business owners looking for insight into the budding marijuana industry. To that end, ganjapreneurs should be working with a team of advisors or consultants with experience across a variety of industries to ensure the success and longevity of their brand. According to early industry reports and analytics, the LEGAL cannabis market was worth between $6.6 and $6.7 billion in 2016, up from $5.4 billion in 2015. Through the efforts of ambitious entrepreneurs—and with the aid of technology—cannabis products are getting modernized, revamped, and rebranded to appeal a broad new audience of more than 100 million adults in America that have access to legal marijuana. These efforts are beginning to come to fruition, especially for product manufacturers who have been able to launch lines of extracts, tinctures, topicals, concentrates and other products that have reduced the demand for traditional marijuana to less than 56% of the cannabis industry. One of the unique dynamics shaping the development of the cannabis industry is its proximity patient advocacy efforts and helping those who need marijuana for medical reasons. In every way, it was the medical marijuana patient who enabled the legitimization and the growth of the cannabis industry both in America and abroad. Moreover, medical consumers currently make up the vast majority of marijuana users, but that ratio is expected to change as new recreational markets launch in America and Canada. One of the unique dynamics shaping the development of the cannabis industry is its proximity patient advocacy efforts and helping those who need marijuana for medical reasons. In every way, it was the medical cannabis patient who enabled the legitimization and the growth of the cannabis industry both in America and abroad. Furthermore, medical consumers currently make up the vast majority of industry consumers but that ratio is expected to change as new recreational markets launch in America and Canada. Despite the growth that increased access to recreational marijuana is set to propel, medical patients will remain a dominant force in the marijuana market for years to come. According to New Frontier, a Washington D.C.-based analytics firm, medical patients not only made up the bulk of the marijuana consumer market, but they also spent three times more money on cannabis than recreational customers AND returned to shop more often, buying every ten days instead of every 14. Between since last year, more states passed laws to open new marijuana markets and expand existing markets than in any previous three-year period. This year alone, two different bills were submitted to Congress to propose the rescheduling of Marijuana while the recreational market in Nevada launched with record-breaking sales that prompted a statement of emergency from the Governor’s office. With this backdrop of public and legislative support, new market opportunities will help to drive the sustained growth the cannabis industry has seen since launching for years to come. 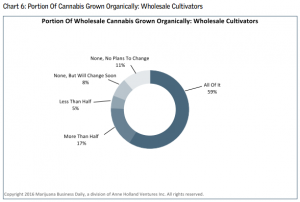 According to one analytics firm, the cannabis industry experienced a 34% compound annual growth rate (CAGR) from 2014 to 2016, largely propelled by the initiation of adult use sales in Colorado and Washington. This year, the rate of increase is expected to sit between 16% to 22% as states who voted to establish cannabis markets plan and implement their new market programs. As new markets in the remaining seven states that voted to open cannabis markets get ready for launch in 2018, growth will once again leap forward. The state of Nevada chose to enact a fast-tracked “emergency” marijuana program that enabled the state to begin collecting millions in tax revenue practically right away. The expanded recreational marijuana market in Nevada is expected to bring in $700 million in taxes over the course of two years. Early CAGR estimates are set to linger between 25% to 27% over the course of the next few years to hit an approximate $22.6 billion in 2021. Sales in Nevada will grow at a 51% CAGR. Estimated growth from $121.6 million in 2016 to approximately $630 million by 2020. “The scale of the impact is expected to be massive. 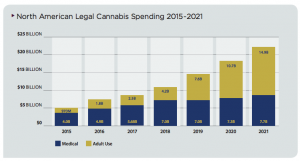 By 2020, adult use markets are projected to add $484.3 million in annual sales, and account for almost three-quarters of the total legal cannabis market in Nevada.” Founder and CEO of New Frontier, Giadha DeCarcer. As retailers have had the opportunity to interact with patients and customers, medical and recreational marijuana dispensaries are taking the helm as the faces of the cannabis industry. Dependent on the state’s inventory regulations, dispensaries or marijuana retail stores don’t stockpile inventory, and each customer can work one-on-one with a budtender. Because dispensaries are at the very end of the supply chain, their financial performance has remained one of the more reliable indicators of industry demand, market size and future growth. 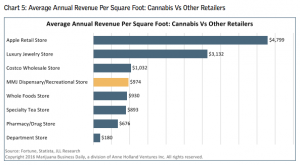 Typically, increases in customer traffic drive sales per square foot in dispensaries. As retailers in Nevada have seen, sales per square foot for cannabis retailers can be significantly higher than that of other businesses in other industries they are often compared to. Despite their best intentions, the fact of the matter is that around 77% of cannabis businesses are noncompliant. The compliance of different cannabis businesses varies from market to market and relates directly to the difficulty businesses are having with constantly shifting in local regulations. If dispensaries are the face of the cannabis industry, companies that grow marijuana, are its beating heart. When measuring the growth of grow operations, it’s imperative to note that different state markets feature both vertically integrated dispensaries and stores with grows, and commercial cultivators who sell their marijuana to infused product makers and dispensary retailers. These businesses are also the site of significant oversight as the health and safety of cannabis products is at the forefront of many legal and political conversations. For this reason, the use of pesticides, solvents, and nutrients containing heavy metals are often the onus for detailed and complex production regulations. Despite an admittedly complex regulatory setting, this sector is another area of the cannabis marketplace poised for rapid growth and expansion, as the establishment of marijuana markets will help industry leaders and public officials refine their approaches to production and regulation. While most people think of grow houses or dispensaries when they think of the marijuana industry, an enormous part of the industry revolves around ancillary service companies that provide the products, technology, packaging, marketing, and other services to cannabis businesses and consumers. 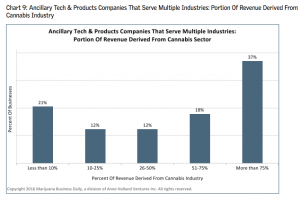 Though the majority of ancillary companies are focused solely on the marijuana market, a growing number of firms from other industries are starting to throw their hats in the ring without abandoning their primary markets and alternate revenue streams. As cannabis businesses require more consulting and specialty services like tax specialists or marijuana content marketing consultants to establish your brand, ancillary service companies saw a 75% increase in services rendered to cannabis companies. 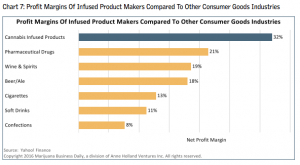 Cannabis infused products, like concentrates, cartridges, edibles, and topicals have become incredibly popular in the markets where they are legal. While variances in specific statistics vary slightly from firm to firm, it’s becoming increasingly clear that concentrates will play a significant role in shaping the future of cannabis product offerings demanded by consumers. With more Americans than ever fighting to retain or obtain their right to consume cannabis legally, the growth seen in every sector of the cannabis industry will continue to develop and gain importance. As the cannabis industry totters on the edge of greatness, it’s clear that American ambition and innovation are setting the foundation for what could be the next great industry in America and perhaps even the world. Legalization efforts have enabled researchers and scientists to begin exploring the medicinal properties and applications of marijuana while businesses make their own advances in the fields of genetic and intellectual property. These trends feed directly into the innovation and growth we see from craft cannabis brands, labels, and products in every niche of the cannabis industry, particularly in the space of luxury cannabis brands and services. Data is also proving to be a worthwhile investment as the industry is so new and medical marijuana consulting firms are rushing to compile financial data, benchmark information, and in-depth market insight through market research to help establish baseline metrics for the budding marijuana industry. Variances from state to state when it comes to legalized medical or recreational marijuana means that tracking and reporting systems aren’t uniform across different markets, and in some cases, may not even exist. Several states don’t track anything, and as no federal agencies oversee any aspect of the industry, there is no official national data for businesses to glean from. Though business owners often find useful market information by looking at the filings and financial statements of publicly traded companies in their industry, the vast majority of cannabis companies are privately held. Further, those marijuana firms that are publicly traded are listed on over-the-counter markets, which have minimal reporting and disclosure requirements. Make sure you’re implementing quality marijuana content marketing online and off to establish your brand and take advantage of the cannabis industry’s incredible growth. The spark your cannabiz idea needs is just a call or consultation away—connect with us today! PreviousPrevious post:How Regulations Are Changing Marijuana Marketing and AdvertisingNextNext post:What Does Your Packaging and Marijuana Display Advertising Say about Your Brand?